An op-ed from our partners at James Beard. When navigating the turbulent waters of seafood sustainability, it can be difficult to know the types of questions you should be asking your waiters and fishmongers. One query that frequently comes up is whether we should be eating farmed fish. Chef and advocate Barton Seaver made the case for aquaculture for us earlier this year, but as with much of sustainable seafood, there’s plenty of nuance beneath the surface. We asked Corey Peet, the technical advisor for our Smart Catch program, to delve into the issues behind the farming industry of one of the country’s most-craved crustaceans: shrimp. Do you eat farmed shrimp? This can be a harder question to answer than most people realize. Many folks in the food community have heard that farmed seafood, or aquaculture, is a bad thing. This perception largely stems from headlines about the salmon and shrimp industries that tout their negative impacts including environmental, social, and food safety concerns. As a result, many consumers aim to avoid farmed seafood. However, if you’ve had shrimp in the United States in the past couple of decades, chances are you have eaten farmed shrimp—since only about 20 percent of shrimp consumed domestically is wild-caught. Farmed shrimp is one of the most consumed, most valuable, and most controversial seafood items available today. 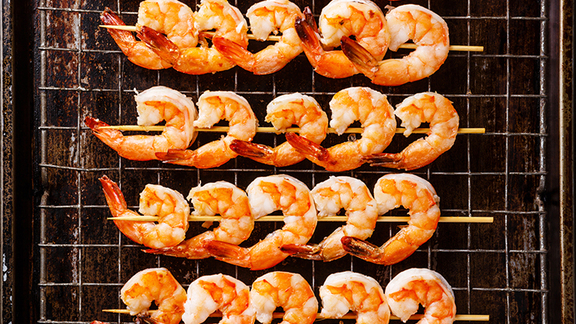 In the early 1990s, the “Pink Gold Rush” spurred the rapid global expansion of farmed shrimp due to record-high shrimp prices in markets like the United States. During this period, the industry grew rapidly and recklessly, resulting in the destruction of mangrove forests, pollution, and the heavy use of chemicals and antibiotics. In addition, there were also social impacts, such as upheaval and restructuring of communities in farming regions, significant labor abuses, and even the murders of those that protested shrimp moving into their lands. Over the last few decades, some of these issues have been mitigated or partially addressed due to international pressure and condemnation, but recently a new travesty has been revealed: slavery. In Southeast Asia, bonded and forced labor have been taking place on the vessels that provide fishmeal for the region’s shrimp aquaculture feed. Producing countries in Southeast Asia have shouldered most of the blame, but, as with most issues, things are not that simple. More realistically, the entire supply chain is at fault. This includes consumers in countries like the U.S. The deeper issues that allowed for slavery in seafood supply chains arise from shrimp aquaculture’s transformation into a commodity industry. Commodities compete on price, and are generally characterized by a “get all you can while you can” mentality from supply chain participants, including buyers, processors, and farmers. Shrimp is viewed as a commodity, like wheat or corn, and so everything moves towards one value proposition. The reality is that the shrimp industry is much more diverse, featuring producers from small-scale, family-run farms all the way up to operations that resemble agricultural feedlots. [MB1] Recognizing the diversity within the industry and celebrating producers with better practices is a critical piece of creating a sustainable future. Coffee was once also viewed as a commodity, before branding and coffee shops in North America dramatically changed its industry and supply chains. We can now differentiate between organic and FairTrade coffee, for example, and consumers can make more informed choices based on their preferences. A similar story of change may be possible for the farmed shrimp industry. For example, the Asian Seafood Improvement Collaborative has created a dialogue with industry stakeholders to build improvement standards that encourage innovation and better production, while realigning incentives and ensuring that farmers are getting fair value for their shrimp. This process has the added benefit of being a bottom-up rather than top-down approach, bringing stakeholders from the region together to help them build their own standards. One of the most compelling things about shrimp aquaculture is that in spite of its popularity across global markets, small-scale producers do most of the farming. This means that there is a real opportunity to create positive change in small communities around the world if the significant mistakes of the industry’s development can be reconciled. The shrimp industry could improve if it was significantly restructured and if the incentives were shifted—and many people are working to do just that. With these improvements and changes, we can start to move from the idea of simply “shrimp” to the types of complex distinctions we make with other protein sources. Just as we look for “grassfed beef,” we can look for “mangrove shrimp,” “shrimp from small Asian community X,” or even “fish-free shrimp.” Even such small steps as these can help us to more fully realize the potential food security and livelihood benefits of the farmed shrimp industry, for the people growing the shrimp, and those of us who enjoy their harvests. For more information on farming shrimp, visit Monterey Bay Aquarium's Seafood Watch, and read the Associated Press's Pulitzer Prize–Winning series, Seafood from Slaves. Learn more about JBF’s sustainable seafood program, Smart Catch. Corey Peet is the technical advisor to Smart Catch, and has worked to improve sustainability in seafood for over a decade. His recent work has focused on Southeast Asia where he has helped to support the development of the Asian Seafood Improvement Collaborative, a group of stakeholders working to build their own fisheries and shrimp aquaculture improvement tools. Follow him on Twitter. Originally published on jamesbeard.org on July 31, 2017. A guide from our partners at James Beard. There's no shortage of things to be outraged about right now, but well, here's another from our friends at Civil Eats.